What Does an Infantryman (11B) Do? The infantry is the main land combat force and the backbone of the Army. It's equally important in peacetime and in combat. The Infantryman's role is to be ready to defend our country in peacetime and to capture, destroy and repel enemy ground forces during combat. Do you want to become a fighting member of the US Army? Consider the 11X recruiting program that pipelines the Army Infantry training program from Basic to your first command. As a recruit and new trainee, the 11x program will challenge you and test your will to see if you can become an Infantryman 11B or "Eleven Bravo." Out of the two 11x options (11B / 11C) most will become 11B as there is more of a need for them in the Army. How important is infantry to the Army? The infantry is 15 percent to 17 percent of the Army. You cannot enlist with a guarantee for MOS 11B. Instead, you enlist under the Army's 11X - Infantry Enlistment Option, and during training, you will be designated as either MOS 11B, Infantryman, or MOS 11C, Indirect Fire Infantryman. But you have to earn it, meeting the standards along the journey while in training. As an 11B Infantryman, assist in the performance of reconnaissance operations, employ, fire, and recover anti-personnel and anti-tank mines, and locate and neutralize mines, operate, mount/dismount, zero, and engage targets using night vision sight. Operates and maintain communications equipment and operate in a radio net; operate in an NBC contaminated area; construct field expedient firing aids for infantry weapons; perform as a member of a fire team during a movement to contact, reconnaissance, and security, an attack, defense, situational training exercises and all infantry dismounted battle drills. Process prisoners of war and captured documents. Lead an infantry team in combat operations, providing tactical and technical guidance to subordinates and professional support to both superiors and subordinates in the accomplishment of their duties; lead, supervise, and train subordinate personnel. Call for and adjust indirect fire; evaluate terrain and select weapon emplacement; control organic fires; install and recover anti-handing devices on anti-tank mines and electrical and non-electrical demolition charges; supervise the construction of hasty fortifications and receipt, storage, and the issue of ammunition. Record operational information on maps; receives and implement combat orders, direct deployment of personnel in offensive, defensive, and retrograde operations. Request, observe, and adjust direct supporting fire. Evaluate terrain and supervise the emplacement of sighting and firing all assigned weapons; use maps and map overlays, perform intersection and resection, and determine elevation and grid azimuths; lead a fire team during a movement to contact, reconnaissance and security, an attack, defense, situational training exercises, and all infantry dismounted battle drills. 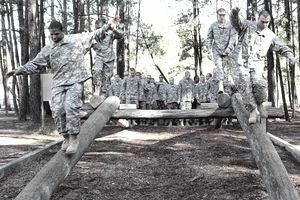 Preparation to be an infantryman involves testing and several types of training. Testing: ASVAB Score Required: 90 in aptitude area CO. Initial training: Initial Training in this MOS is primarily conducted through One Station Unit Training (OSUT), which combines basic training and job training into one single course of instruction. OSUT for 11B, Infantryman is 13 weeks, 3 days at Fort Benning, Georgia. Additional Training: Specific formal training opportunities for this MOS, including advanced training courses available at specific points of the soldier's career, can be found on the Army Training Requirements and Resources System (ATRRS) Web Site. Correctable vision of 20/20 in one eye; 20/100 in the other eye. Job training for Infantryman requires 14 weeks, three days of One Station Unit Training (OSUT) which includes Basic Training and Advanced Individual Training. However, in 2019, the Army is adding another 8 weeks to Infantry Training to include expanding OSUT with a combatives course, combat lifesavers course, more day and night land navigation, and different weapons qualifications. The new 22-week OSUT Infantry Training will have an operational focus for the Infantry Soldier. Soldiers will get more day and night shooting with their M4 rifle, M240 machine gun, and the M249 squad automatic weapon. Soldiers will also spend more time in the field, including tactical training that focuses more on squad formations during day and night operations to include land navigation. Basic combative training (hand to hand combat), tactical combat casualty care (TCCC) and more will be added to the curriculum during the added eight weeks. The added time also includes six days of vehicle platform training which is an added 5 days. Soldiers assigned to a Stryker or Bradley unit will learn how to drive and perform maintenance on their assigned vehicle as well. The training will take place primarily in the field, with some classroom training. Subjects include Landmine warfare, anti-armor techniques, M203 grenade launcher, machine guns, military operations on urban terrain and squad tactical training. The skills you learn will help prepare you for any chosen career. Soldiers interested in various jobs once out of the military may be eligible for civilian employment by enrolling in the Army PaYS program. The PaYS program is a recruitment option that guarantees a job interview with military friendly employers that are looking for experienced and trained Veterans to join their organization. You can find out more online at the Army PaYS Program site. The job of an infantryman is often performed in an outdoor setting, and personnel may be transported to different locations via land, air or sea.